With Gazebo another powerful and state of the art robotics simulator is ready to use with SmartSoft. In the same way as MORSE, RobtinoSim, player and others simulators, Gazebo can be used very easy with SmartSoft without requiring other complicated infrastructure (e.g. no ROS required). With Gazebo accessible within the SmartSoft ecosystem, it is now possible to reuse many other existing SmartSoft components in collaboration with Gazebo. 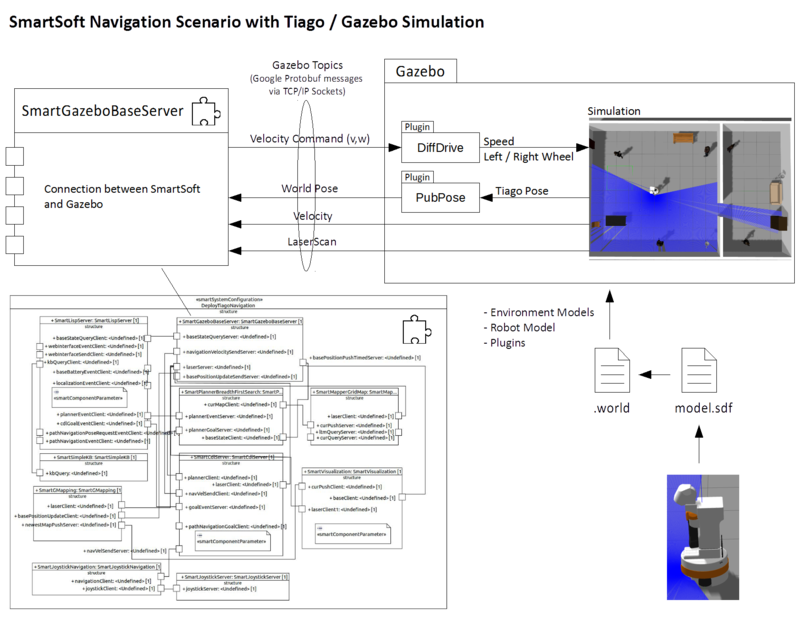 The SmartSoft principles, the component model and the SmartMDSD Toolchain are ready to use for robotics software development using the Gazebo simulator. An example component how to interface a robot (differential drive, equipped with a laser ranger) simulated in Gazebo, is the SmartGazeboBaseServer. The component illustrates how the Gazebo simulator can be used with in the SmartSoft ecosystem through components. The SmartGazeboBaseServer component receives from and sends messages to gazebo containing the robots odometry, the laser scans and the commanded velocity, and offers those information to other SmartSoft components via its services. Other sensors or actuators can easily be added in a similar component, using the SmartGazeboBaseServer as a blueprint. SmartGazeboBaseServer is released under LGPL and can be downloaded from sourceforge. To provide a quick and easy entry into SmartSoft and Gazebo simulation, the most recent version of the SmartSoft VM contains an installed gazebo simulator. A modelled deployment can be started using the SmartMDSD Toolchain within this virtual machine. The deployment realizes a simple navigation scenario, where the Tiago robot (PAL Robotics) navigates within a simulated flat either autonomously or steered by a joystick. To try things out within the VM, just follow the next few steps. If you want to run the scenario natively on your computer a quick install guide is appended. Note: The VM uses VirtualBox and is tested to work with versions 5.0 and 5.1, no guest additions installed (not working with guest additions). The performance is not particularly high, but ok for testing. Deploy and Start the Depolyment by right-clicking on DeployTiagoNavigation in the Project Explorer and select Deploy+ Run SmartMDSD Deployment. Once the files have been deployed (local directory within the VM), a dialogue will pop up and ask whether you want to start the deployment, select yes. The following scenario control menu will open, select menu-start. The scenario starts and a few terminals will open, each for every started component. The robot will then drive to the selected goal location (see figure below). After the goal is reached, the menu will appear again. 10. With the SmartMDSD Toolchain, open the model of DeployTiagoNavigation and define a deployment directory in the Deployment tab by selecting the device block. Continue with the section: Starting the scenario, see above. 1. Create a Host-only network (File → Preferences → Network → Host-only Networks → Press Add Symbol (+)) which enables communication between the host and the guest system. And the same for the guest system. before starting the navigation scenario.